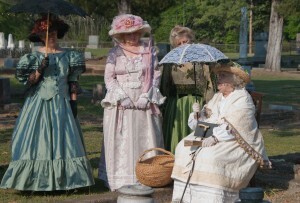 The first weekend in May for 67 years, the Jessie Allen Wise Garden Club has celebrated the beauty of spring in Jefferson, Texas with their annual Jefferson Historical Pilgrimage. This year’s theme is “Jefferson’s Golden Era” and will be held May 1, 2, 3, and 4, 2014. Jefferson is filled with events and activities for everyone. Take a trip to the 1860s while enjoying present day amenities. Beginning on Thursday, May 1, at 7:30 pm, the 60th Annual Diamond Bessie Murder Trial will present 5 performances in the Jefferson Playhouse (corner or Market and Henderson streets) and continuing with productions on Friday, May 2, at 7:30 pm, Saturday, May 3, at 5:30 pm and 8:30 pm and Sunday, May 4, at 2:00 pm. Tickets may be purchased by calling 903-665-6075 or writing Diamond Bessie Tickets, 313 Woodland Drive, Jefferson, Texas 75657 (advanced tickets are strongly advised). Becky Palmer will be playing Diamond Bessie for the 30th year. On Friday and Saturday, May 2 and May 3, from 11 am – 4 pm, tour five historic churches. The five churches, Methodist, Presbyterian, Episcopal, Catholic and Baptist, were established in the early days of Jefferson and played a vital role in the life of Jefferson which continues to this day. The buildings were built during the mid 1800s and their architecture holds significant historical beauty and value. Period dressed docents will greet you presenting the entertaining stories contained in the church histories. While touring, you will see the many articles, pictures, furnishings and antique items each church houses. Tickets may be purchased by calling 903-665-2513 or 800-490-7270 or at Pilgrimage Headquarters in front of the Excelsior House beginning at 9:30 am each day of Pilgrimage. Enjoy the Crafts Fair and Heirloom Plant Sale in Perry Park next to the Excelsior House on Friday and Saturday, May 2 & 3, 9:00 am – 5:00 pm and Sunday, May 4, 9:00 am – 3:00 pm. The “Stitch, Woven & Hooked” exhibit of quilts and heritage fiber arts will be held on Friday andSaturday, May 2 & 3, 9:00 am – 5:00 pm in the Jeffersonian Institute at 120 East Austin Street. Should you wish to enter one or some of your quilt, embroidery, hooked or stitched projects, contact us at 903-665-2513 or e-mail jessieawise@msn.com. At twilight on Friday and Saturday, May 2 and 3, from 5:30 pm to 7:00 pm, be delighted and inspired as you stroll through four beautiful gardens. Downtown is the place to be on Saturday, May 3, at 10:00 am. Enjoy the Pilgrimage Parade followed by the Town Skirmish. Watch as Confederate troops protect Jefferson from the Federal troops. The full scale Battle for Jefferson re-enactments battle site is Cypress River Ranch on FM 2208. The first battle is on Saturday, May 3, at 4:00 pm and the second battle is on Sunday, May 4, at 1:30 pm. Signs will direct you to the battle site where there is plenty of parking. This is the largest Civil War battle re-enactment in Texas. After the Pilgrimage Parade and Town Skirmish, enjoy The Excelsior House Grand Ballroom/Courtyard Luncheon Buffet served from 11:30 am – 2:00 pm at $14.00 inclusive. Reservations are strongly recommended by calling 903-665-2513 or 800-490-7270. Continue your Pilgrimage experience on Sunday morning, May 4, at 10:00 in front of the Christ Episcopal Church on Main Street across from Lion’s Park as you watch the Presentation of Colors. This is the re-enactment of Miss Fannie Benners’ horseback ride presenting the flag, which was made by the women of Christ Episcopal Church, to the Jefferson Guard as they leave to fight for the Confederacy. Jefferson offers historic hotels, antique and gift shops, bed and breakfast inns, fine restaurants, museums, historic Oakwood Cemetery, train rides, riverboat rides, horse-drawn carriages, mule-drawn wagons, Jay Gould’s private railcar, the R.D. Moses model railroad and much more. Visit our web site www.jeffersonpilgrimage.com or e-mail jessieawise@msn.com orjgoulds@aol.com or call the Excelsior House at 903-665-2513 or 800-490-7270. Step back in time as the Historic Jefferson Railway, an antique narrow-gauge train, embraces an old-fashioned Christmas in the country. 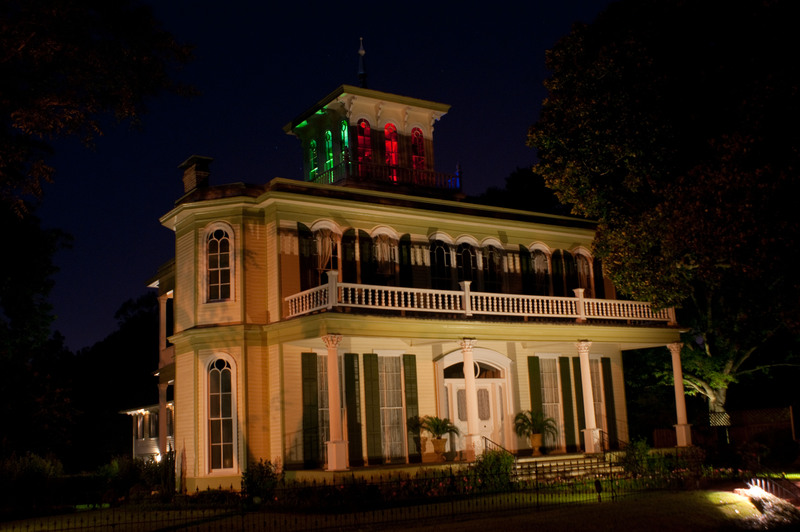 Enjoy the lighted vignettes and hear the story of “Celebrations Around the World” aboard the train that circles the Piney Woods along the Big Cypress Bayou. The decorated historic railroad depot captures the holiday spirit complete with Santa and Mrs. Claus. 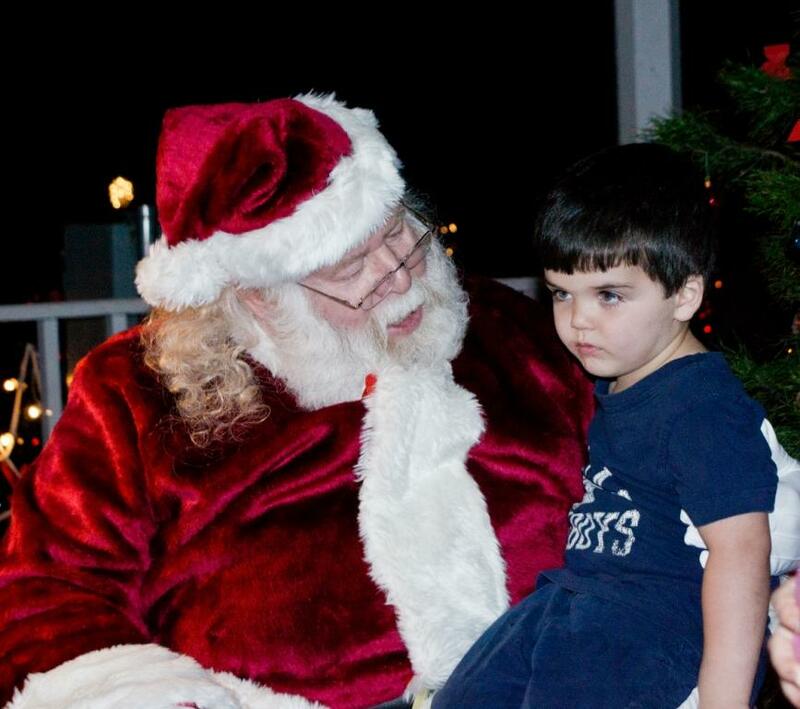 The Christmas Train opens on November 28, 2013 and runs Thursday, Friday, Saturday and Sunday through December 22, 2013. (Closed December 1st). 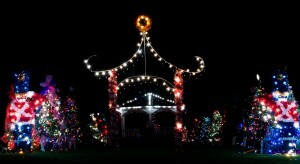 Also, ring in the New Year with the Rail of Lights New Year’s Train running December 26-29 and the 31st. This ride will feature the dropping of the ball in Times Square, complete with beverages, noisemakers and a fantastic fireworks show on every train ride. Tickets are going fast. Buy yours online at www.RailofLights.com before they are sold out. Santa and I waiting for the parade to start. Christmas is one of my favorite times of year in Jefferson. Every weekend there is something new going on to celebrate the season. The first two weekend’s of the year are always the Candlelight Tour of Homes and the Christmas Carols at the local churches. The Rail of Lights Steam Train goes on every weekend from Thanksgiving to New Years. 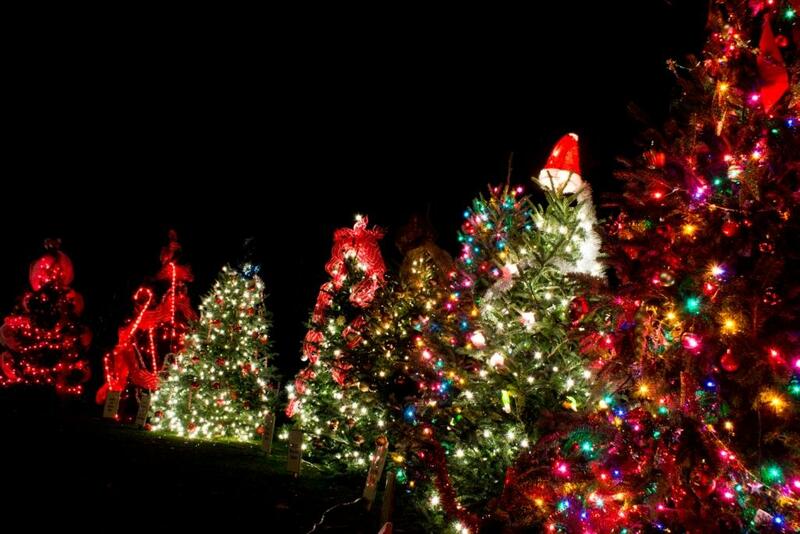 The Enchanted Forest with a hundred decorated and lit Christmas Trees in Lions Park is sure to put even Scrooge in the Christmas Spirit but my favorite event of the year is the Old Fashioned Christmas Parade which wanders through the streets of Jefferson the third Saturday of December. 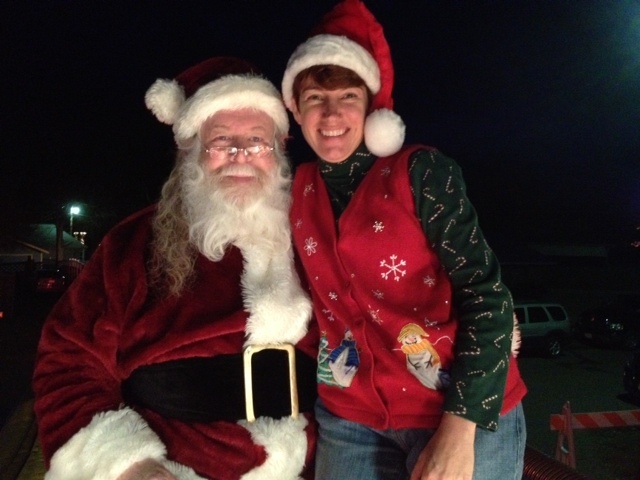 This year, I was promoted to Chief Elf and got to ride on top of the fire truck with Santa Claus throwing candy out at the Kids. I had so much fun and hope I get to keep my position next year even though I will be off the Marion County Chamber of Commerce Board of Directors. Enjoy this little video I put together of our Santa having a little fun while waiting for the parade to start. I hope it brings a smile to your face and some Christmas Spirit to your day. MONDAY, DECEMBER 12, 6:00 P.M.
Due to recent rain, Jefferson’s Christmas Parade has been rescheduled to MONDAY, DECEMBER 12, 6:00 p.m. There is a nice rhythm to life here in Jefferson. Life is predictable and comfortable. For instance, you know that if it is the day after Thanksgiving all the town’s folk are going to gather around the gazebo at Lions Park and light the Enchanted Forest. That is why Friday night, I joined my friends and neighbors for the traditional kick off of the Christmas Season in Jefferson in Lions Park. Every year the Historic Jefferson Foundation sells over a hundred Christmas trees to local businesses and townsfolk. These beautiful trees are all decorated and lit for the enjoyment of all in the Enchanted Forest in Lions Park. It is quite a spectacle to see that many lit Christmas Trees in one place decorated and twinkling in all of their glory. Just the very sight of all of these trees will turn any Scrooge into a Christmas Elf. We all gather at dusk at Lions Park for the official Tree Lighting ceremony. Carols are sung, poems are read, and excerpts from plays are acted out. It is a jouyous and cozy celebration of Christmas in a small town. Everyone knows everyone and we all wish each other a Merry Christmas. If you have never made it to Jefferson during the holidays, then you are missing a wonderful small town (think Norman Rockwell) Christmas. Here are the pictures from this year’s event. Enjoy! MONDAY, DECEMBER 5, 6:00 P.M.
Jefferson’s Annual Christmas Parade will take one back to a simpler and more idyllic time Monday, December 5 at 6:00 p.m.
Lighted floats depicting nativity scenes, carolers, and bands are but a sample of the things to see. The evening’s special guest, Santa Claus, atop a fire truck will be making a list and checking it twice. “Some of our guests said this was very touching as it evoked childhood memories of long ago”, Juanita Wakefield Chitwood, Executive Director, Marion County Chamber of Commerce. Originating at Lion’s Park, the parades will weave its way along Henderson, Market, Austin, Polk and finish at Brookshire’s along Broadway. Join in on the fun as we celebrate Christmas as it was many years ago. In addition to the traditional evening trains, Historic Jefferson Railway has added a few day runs so that patrons can experience the beautiful ride along the Cypress Bayou River. Day runs will be available on December 9, 12, 13 and 14 at 1:30 p.m. No reservations necessary – there will be plenty of room available. Tickets are now on sale for the evening trains. As seating is limited, get your tickets early. 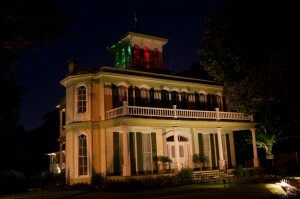 Make this a holiday to remember aboard the Rail of Lights Christmas Train in Jefferson, Texas. The unforgettable ride aboard an old-fashioned steam train departs each Thursday, Friday, Saturday and Sunday, Thanksgiving through December 24. Passengers will enjoy lighted scenes along the Cypress Bayou River as they hear about “Christmas Traditions Around the Globe”. Also, ring in the New Year with the Rail of Lights New Year’s Train running on December 30 and 31st. This ride will feature the dropping of the ball in Times Square, complete with beverages, noisemakers and a fantastic fire works show on every train ride. Spend the weekend in Jefferson and stay in the Cypress Bayou RV Park, just one mile from Jefferson. You can see lights on the river during the Christmas Trains and watch the New Year’s fireworks as the train comes through the park. 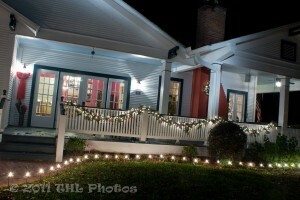 Ask about our special holiday get-away pricing of $15 per night. The excursions will take you by a life-size nativity scene, the German Markets, Jerusalem and the Angel Tree. Glimpse Christmas trees simply decorated reminiscent of the bare-limbed sourwood of the Appalachian Christmas Tree. View scenes representing Toyland, Alaska, San Francisco, China, Australia, New Orleans, and the Arizona Hopi Indian nation. Enjoy an authentic life-sized 90-year old Christmas card as well as the Support Our Troops display featuring a post card sent by soldiers during World War II, and other favorites: the aluminum tree, reminiscent of the 1960’s; a whimsical Teddy Bear tree; and Charlie Brown’s forlorn little Christmas tree. The decorated historic railroad depot captures the holiday spirit. The narrated tour on the day train will be a combination of Jefferson history and description of our Christmas scenes. 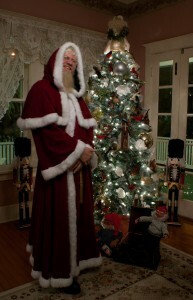 During the evening, visit with Santa and Mrs. Claus before boarding the train for the wonderful narrated tour, accompanied by a local vocalist, who will give patrons an opportunity to sing some of their favorite Christmas Carols as they create unique Christmas memories riding along the river. Ticket Prices: Day train First Class $16.50; Coach Class $13.00. Evening Trains: First Class $21; Coach Class: $14.75 – $16.50. Lap children under 4 are free. First Class is offered in a beautiful historic, heated, enclosed coach. If you are riding Coach Class, be sure to dress warmly and bring a blanket, as you will be riding in open cars. Seating is limited on the evening trains so purchase your tickets early. 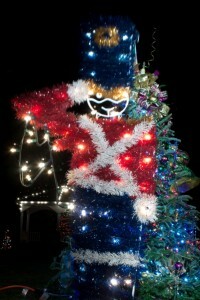 The easiest way to get tickets is to order online at www.RailofLights.com. Jefferson is nestled deep in the Piney Woods of East Texas. It seems frozen in time and is an elegant reminder of a bygone era. The downtown area will be aglow with lights and greenery during the holiday season. You will want to make Jefferson and the Christmas Train a tradition for your whole family. 210 E. Austin St. Open 9:00am-? *Hours of operation subject to change without notice. Tour Some of Jefferson’s Most Historic Homes and Visit with Residents from Jefferson’s Past such as Jeannie Epperson, Confederate Captain Joseph H. Pratt and I.E. Smith. It is hard for me to believe this but it is already Christmas. Today is Black Friday and the malls and stores are jam packed with people. Cars are circling over-filled parking lots and there are long lines at the cash register. It hardly feels like Christmas, more like an over-hyped department store sale. The non stop commercials and advertisements will make even the most cheerful person say Bah Humbug. If you need a break from all of this craziness, come on down to Jefferson for an old fashioned Victorian Christmas. There is no place more magical than Jefferson at Christmas. 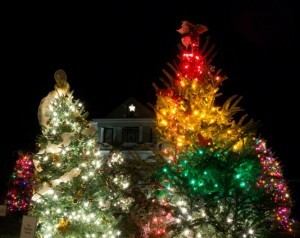 The beautiful historic homes twinkle with brightly colored Christmas lights and the town is festively adorned with Christmas trimming. The churches are filled with Christmas carolers and the parks transform into enchanted forests of decorated Christmas trees. The very air you breathe will fill you with the Christmas Spirit. December 2nd – 4th and December 9th – 11th, the Candlelight Tour of Homes will offer visitors to the picturesque little town the chance to walk through four of the most beautiful homes in Jefferson. Each one of these homes will be dressed in live greenery, glowing candles, and unique Christmas decorations. Docents dressed in Victorian period dress will guide visitors through these houses by candlelight and share the storied histories of these amazing homes. The famous Christmas Rail of Lights will be steaming its way through Jefferson during the Christmas Season. The narrow gauge locomotive will take you through scenes from the “History of the Christmas Tree” as it chugs along the banks of the Big Cypress Bayou. Have your heart warmed by 25 different Christmas scenes built into the forest landscape. The First Methodist Church will be sponsoring this year’s Christmas Music Concert Series each night of the Candlelight Tour of Homes. Sounds of the season resonate throughout Jefferson as these musical concerts perform. Choral groups, hand bells, and chimes delight all ages. The concerts are free to the public. 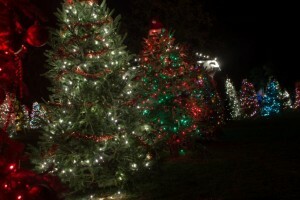 Lions Park will be transformed from a traditional city park to an Enchanted Forest of Christmas Trees. Each Christmas Tree will be decorated by a local business, church, school class or civic group. 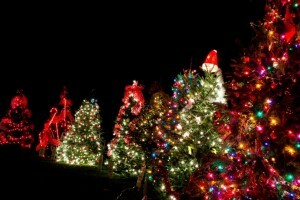 Be enchanted as you walk through a sparkling, wonderland of Christmas trees. There are special festivities at the Carriage House as well. 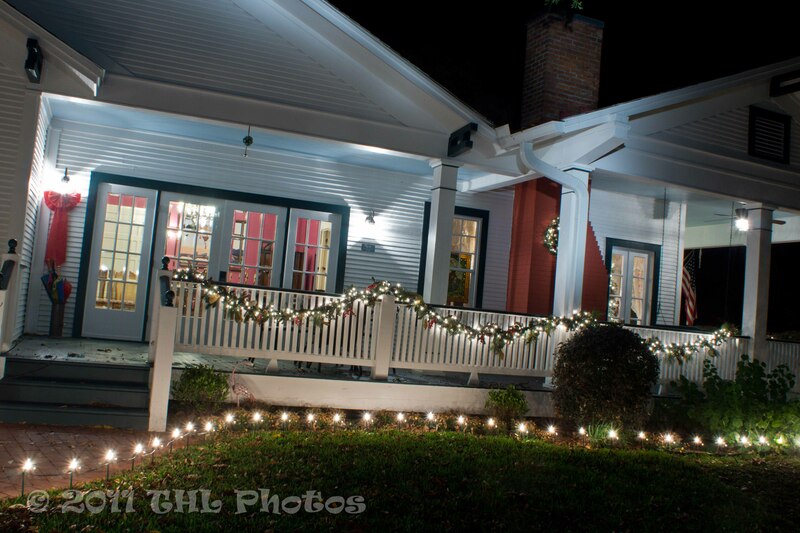 This historic home is beautifully decorated for the season. Sit in our parlor and enjoy the fireplace while sitting by the Christmas Tree. Join us each afternoon as we share a traditional Norwegian Christmas treat of Glogg and Peppercaker. Candlelight in Jefferson is so special that all lodging fills and available rooms become impossible to find. We only have a few rooms left, so please call us at 903-665-9511 to make your reservation today.